Unbelievably, to encourage women in sport a pink sparkly soft-touch football is being marketed in a “pretty pattern that is designed especially for a woman’s grip”. Sigh! Women are more likely to be put off football by the sexism and homophobia in sport, unequal pay and media coverage, rather than the colour and texture of the ball! Unless this is a major satirical spoof, it ticks every possible patronising pitch possible: “pretty” check, “pink” check, “sparkly” check, “soft” check, “easy” check, “glamorous” check! Serious Proposition or Irish Joke? It’s being made in Ireland, and it’s tempting to think that it is an Irish April Fool’s joke were it not January and endorsed by a real sportsman – Ger Brennan, an All-Ireland winning Gaelic Football player. Surely, it has to be a farcical fake designed to challenge rather than collude with sexism in sport? In fact, their Twitter feed is full of jokes, disbelief, and amazingly, apparent appreciation. Lots of “ball” jokes and since one of the founders is female, a lot of poking fun at female stereotypes, or are they deadly serious? From the Ladyball website – an adapted shutterstock image rather than a real photoshoot, suggestive of a spoof? 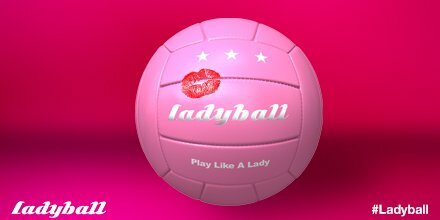 Ladyball is the concept led by a group of aspiring entrepreneurs who have made it their personal goal in life to encourage girls to play more team sports, and to bring a feminine touch to the all too masculine world of sports! 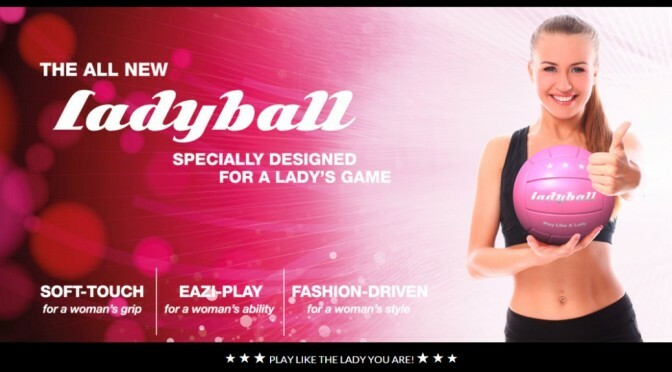 The idea for Ladyball came from personal experience when one of the creators tried various ball sports as a weight loss measure and found the regular (or as we like to call them “man-sized”) balls heavy, cumbersome and difficult to control. 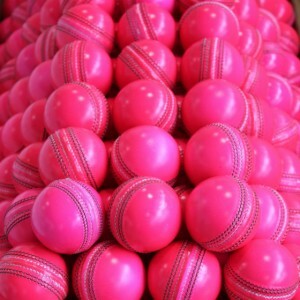 It was then (as Oprah would say) she had an “aha moment”; what if there was a ball designed just for women, a soft, trendy ball that could enhance natural feminine abilities and make it easier for girls to play? After a lot of market research we found that there really wasn’t anything like that available, and in the majority of cases women just had to make do with balls meant for men. In order to fill this gap in the market and with the hopes of making team sports more accessible to women, the idea for Ladyball was born! Since that day we have spent countless hours researching and designing our creation. We want to revolutionize the way ladies play sports. I just got a press release from #LadyBall and there’s, there’s no punchline. It’s a straight release. I am so terribly confused. In cricket, at least, despite divided opinions, it is regarded as an innovation here to stay, but nothing to do with gender stereotypes. Satire, PR Stunt or Sexist Stereotype? Whether Munster Hockey were in on it or not, the @theladyball_com Twitter account has now also confessed to the ruse promoting women’s gaelic football (LGFA) along with Lidl sponsorship, “a lighting rod for the discussion of attitudes to women in sports and an amplifier for voices of support”.